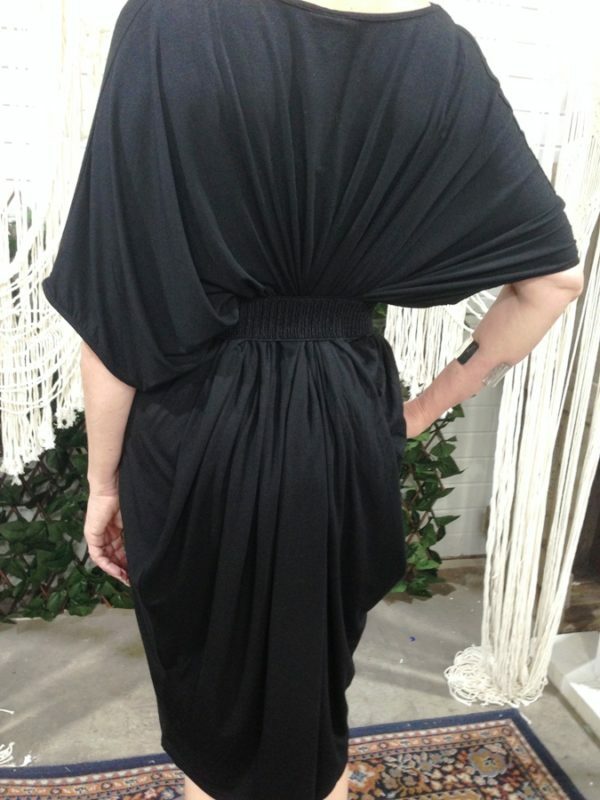 This amazing batwing drape dress is a great addition to your wardrobe. The miracle dress is a simple design thus making it smart casual wear to glam. The addition of a long pendant will elongate the body or a scarf for some added colour. Team with your favourite cape, also layer for cooler days. This amazing batwing drape dress with a V neck is a great addition to your wardrobe. The miracle dress is a simple drape design thus making it smart casual wear to glam. It is also very versatile as you can wear it with the V neck at the front or turn it around to have a different neckline. Also, lots of styling option wear belted to give a waistline, with heels or flats. Or use an elastic band to gather and tie a section inside the dress, on one side around the hip area, to again change the look. It is made from high-quality bamboo jersey, hence providing comfort and stretch. The benefits of bamboo fabric are not only that it is smooth and soft against the skin, naturally antimicrobial and perfect for those with skin allergies and sensitive skins. But also its heat regulating properties are great for summer and women during peri and menopause. Loose around the bodice and hips then comes in around the bottom creating a slimming effect. Not clingy and skims over all the lumps and bumps. A great all year round dress and perfect for travel. Furthermore, it is great for all shapes. Curvy size for girls size 18 to 26. The miracle dress is everything it says it is and more! Incredibly comfortable and fits so well!!!! I took it to Thailand and it travelled really well! A must have!!!!! Thank you, Amy, it’s one of our best sellers and new colours will be available soon.